Gretchen here for my monthly traffic and income report for The Centsible Home. Usually I’m in the kitchen tinkering around with funky low-carb flours, sweeteners, and lots of paleo fats, but once a month I switch gears and write about another of my favorite topics: making money with a blog. 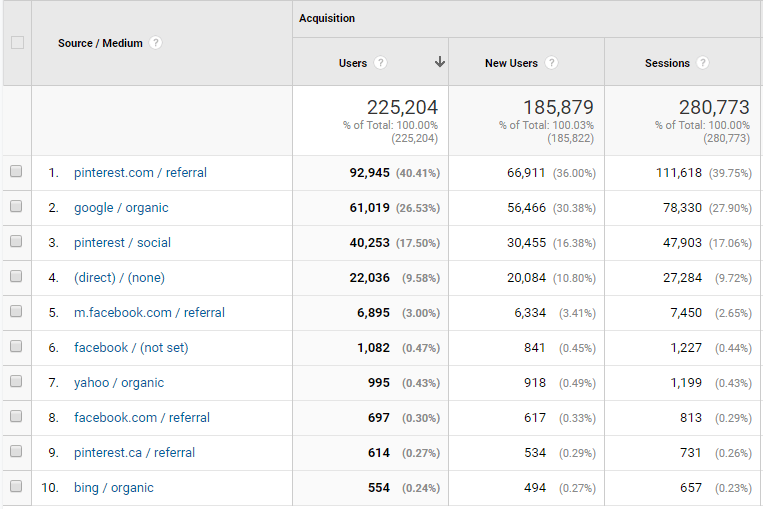 I’ve been doing traffic and income reports for 14 months now, and I’ve been seeing some familiar faces coming back each and every month to read these reports, comment on them, and share them (thank you!) – and I see others here who are new (welcome!). One things I always try to emphasize in these reports is the sheer amount of energy, creativity, and effort that goes into creating and maintaining a successful, income-producing blog. When you look back on previous traffic and income reports, you can see that The Centsible Home didn’t turn out a full-time income overnight. Instead, it was a slow, stead, and very deliberate process. When you navigate to The Centsible Home, you’re likely to see easy frugal ideas, pretty photographs (well, I’m getting better at the photography side), and videos (coming soon!). But what you DON’T see are thousands of emails, edits, hours of writing, hosting problems, negotiations, marketing, and So. Much. More. I am so grateful that you have decided to tag along to see some of these behind-the-scenes strategies that I share with you each month. Actually, thankful, would be a more accurate word, and you make me realize every single day just how blessed I am to be able to talk to you through recipes. With that being said, let’s jump into October 2018’s numbers…. Have you always wanted to start your own blog, but you’re not sure where to start? I am a huge believe in blogging, since it brings in more than $120,000/year to our family, and has enabled us to take amazing vacation, give generously, and save for the future far and above what we would be able to do on my husband’s salary alone. Raise your hand if you pride yourself in being able to multitask? In highschool and college I prided myself on being able to work on several different things at once, and get insane amounts of work done. However, my attitude toward multitasking has changed over the years to allow me to get even more things done every single day using a process called BATCH WORKING. Our brains weren’t made to multitask. Instead, when we try to focus on more than one thing at once, all we’re doing is switching our attention quickly from on thing to another. Nothing is getting our full attention. Studies have even found that multitasking reduces productivity by 40%. And, it increases errors by 50%. I am here to tell you that it is totally ok to focus on just one thing at a time. Not only has it made me more productive, it has taken away so much of my anxiety in my business because I know that the most important things are always done, and that in most areas, I have worked WAY ahead. I sleep easier at night, my brain is less full of “to-do” clutter, and my business is growing faster than ever. First all, Batch Working is a highly focused, very specific form of working. It is putting all similar tasks together and doing them at once over the course of an hour or a day, so you can focus solely on one type of task at a time. You don’t jump from task to task. Instead, you focus all your energy on one type of activity to get your creative juices flowing, and your brain working productively. Answering an email from a sponsor, then working on your taxes, and then sending another email to your accountant. Doing tasks like above isn’t productive, efficient, and forces your brain to move from one thing to the next rapidly. And, the next day you’ll be scrambling to do the same crazy tasks all over again. To Batch work, you would instead, do all the same tasks at the same time. Schedule 30 Facebook posts in 3 hours. In my case, this would an entire month’s worth of posts…done! Sourcing 200 Pins over the course of 4 hours – that’s a month’s worth of content! Writing 4 blog posts in a few hours. (no editing, linking or images…just writing). If you publish 2 posts per month, that’s 2 weeks of posts totally written. Let’s say your first batch working day is Monday. You pick one task, like writing blog posts, and you do that for a few hours up to an entire day. Then on Tuesday, you would design images for the blog posts you just wrote. The images would probably only take up the morning, so then during the afternoon, you would move on to editing and formatting those blog posts. On Wednesday, you would insert affiliate links in the articles(1 hour, tops). The next hour you would get them ready to send to your email list. Hour 3 has you scheduling them to Facebook. During hour 4 you would schedule out the Pins for all the posts, then break for lunch. Come back to work in the afternoon, and in hour 5 you would get Instagram posts together for those blog posts. So, by the end of Tuesday, you have 2 weeks of blog posts completely done and ready to go – and you even have a few hours left in the day! Isn’t that SUCH a load off your mind? This sounds so much better than winging it day by day, doesn’t it? Batch working can seem restrictive or boring, but remember that you can change it up to be whatever works best for you, your schedule, and your workflow. You can customize it by days, by topic, or by task. I prefer to focus by task type. However you Batch Work, it will help you be more efficient, free up space in your brain, let you feel ahead in most areas of your business, and reduce stress/anxiety. You will be able to see your business more strategically so you can work more ON your business, rather than IN your business. What are things that I’m doing every single day that I could hammer out in a really focused hour or two – get them done so I can focus on something else? If you were able to clear some of the mental clutter by batch working, how would you vision for your business change? How could you grow it even more than you are already? Having the ability to look at the big picture in your business allows you to think strategically, with a clear mind. And that is invaluable in creating a sustainable business. For a week, write down every single task you do. Then, decide which items could be not only grouped together, but that you could work ahead on. Look at the tasks that make up a process. Write a list of 3-4 items you decided in #1 and divide them up into the step you need to do to make that happen. Decide about how long each task will take, and create a schedule for yourself. This sounds confusing, but here’s the big takeaway: always break up your batch working into small bite-size pieces so you don’t get overwhelmed as you go along. It’s because of you – yes you! Reading this! – that The Centsible Home exists as you see it today. Thank you from the bottom of my heart for sticking with my and reading, tweeting, pinning, and sharing my recipes with your family and friends. Wow! Congratulations!! Can’t wait to read your November income report. I am still learning how to monetize my blog. I made just shy of $800 in November, but would love to break the $1k mark. Not sure how to best do affiliate marketing on my money focused blog so I have some course I just bought on Black Friday. Thanks a lot for these tips. Batch working seem very doable and maybe the way to grow your blog faster. I’m going to try and see how it works for me. How long it took to grow your income from zero to where you are now?